The Pub, short for Public House, has been a long tradition as a meeting place for locals or regulars. Originally based on the Roman Taverna, it is a relative of the taproom, bar room, and alehouse. It is foremost a place of drinking ale, beer, and spirits. Eventually many began serving small plates of food to sustain its guests while on long drinking binges. Many changed their decor, drink offerings, and food to attract a more varied clientele. There also began in the United Kingdom and Ireland, a tradition of niche pubs including some linked with local breweries and other with lodgings. Welcome to the web site of the Kent House Irish Pub, Towson, MD, U.S.A. With an amazingly diverse crowd and a unique look- the pub is littered with original antiques and interesting bric a brac. 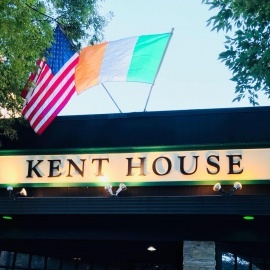 The Kent House Pub offers a truly authentic Irish pub experience as an antidote to the sterile atmosphere of some modern bars. 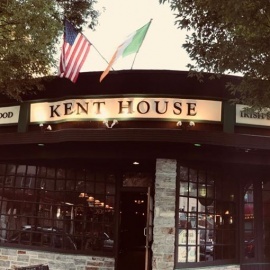 Located on York Road, in the heart of Towson, the Kent House definitely fills the traditional role by providing a wide selection of beers and ales from Europe and local breweries. Smart, simple plates are served with locally sourced foods. We embrace not only an Irish feel, but a European outlook on food, drink, and service. The homey feel; the relating ambiance; and delicious beer and food being served are among the many reasons why the Kent House remains so popular, and a place worth visiting.